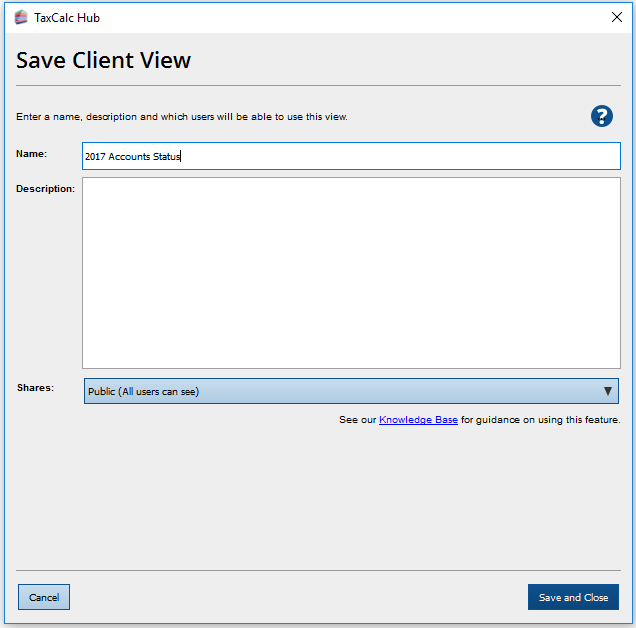 KB Home / SimpleStep® / How do I customise Client Hub? How do I customise Client Hub? The main Client Hub area is very flexible, allowing you to choose the information you see at a glance. 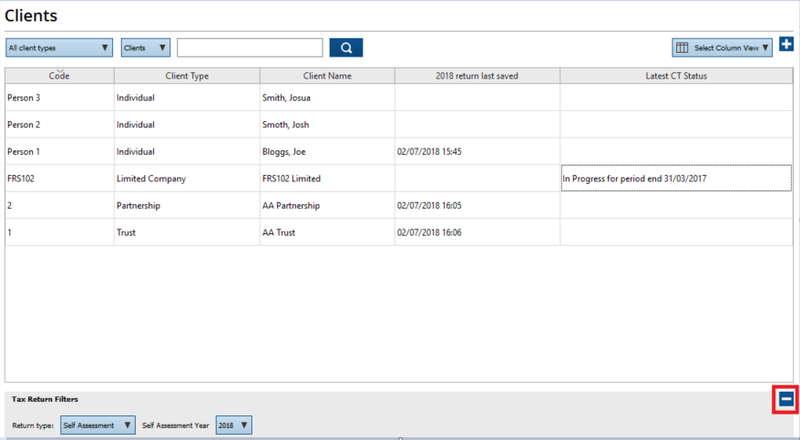 Rather than displaying a simple client list, with client codes and names, you can display items such as the tax return status, Unique Taxpayer Reference (UTR) and details of when the latest return was saved. Hide the right-hand information panel to give you more room for your client list. Amend and save your desired layout of client information for ease of use and consistency throughout the practice. Resize the columns and change their order to suit your tastes. Display the tax return filters panel to see the practice’s current workload – which is great to use towards the end of January. Launch Client Hub from the home screen. Click on – (minus) in the top right-hand corner. This will remove the entire right-hand information panel giving you more column space in the central table. Click on + (plus) to bring the information panel back again. Postcode – the postcode of the main client address. 2018/ 2017 / 2016 / 2015 / 2014 / 2013 / 2012 Tax Status – the current status of the tax return for the specified year. This could be Not Created, In Progress or Filed Online and allows you to easily see the tax status of your Self Assessment clients. Latest CT Status – the tax return status of the latest Corporation Tax return for any company clients. It will also show you the period end date so you can determine the latest return for a client. 2012-2018 / CT600 Last saved date – the date and time the tax return was last saved. 64-8 Status – the current 64-8 status for any client. Latest Accounts Status – the accounts status of the latest accounting period for any client. To show or hide these columns (and the default columns), right-click on any of the column headings and select the relevant column name. To save a column that you've added, click on the drop-down menu at the top right (showing Select Column View in this example). Select Save Current Columns from the drop-down menu. To select and order the columns, right click on the Column header. 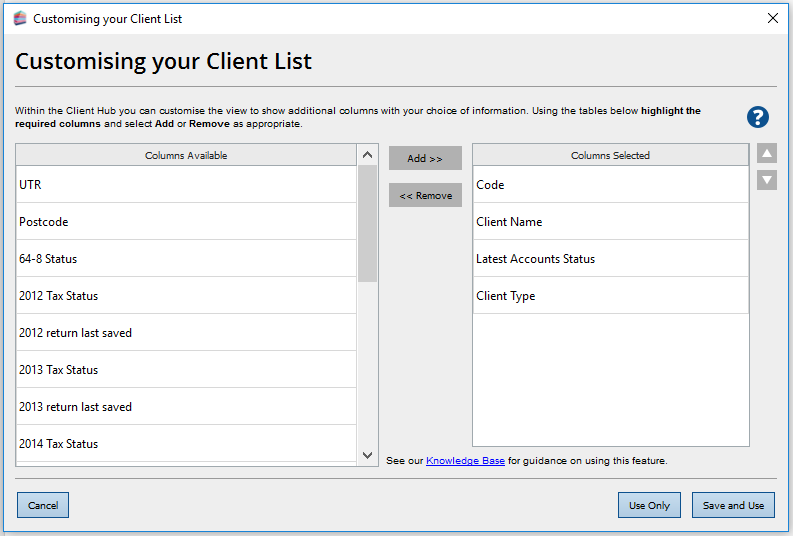 Select Customise Client List from the drop-down menu. 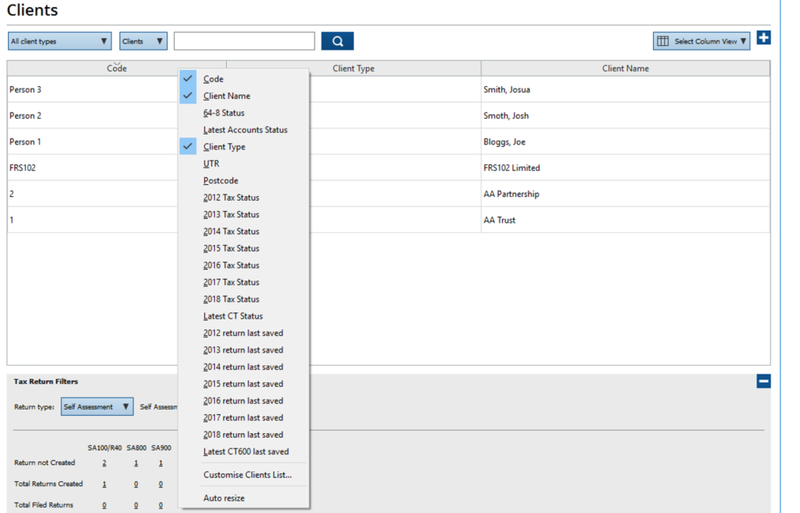 Click on the options under Columns Available that you want to see in your client list. Click on Add >> to move them to Columns Selected. To reorder the options under Columns Selected, click on an option and use the up and down arrows. The option at the top of the list will appear on the left. When you've finished customising the list, click on Save and Use. Select who you want to share the view with from the drop-down menu. To edit or delete a view, click on the drop-down menu at the top right (showing Select Column View in this example). Select Manage Column Views from the drop-down menu. 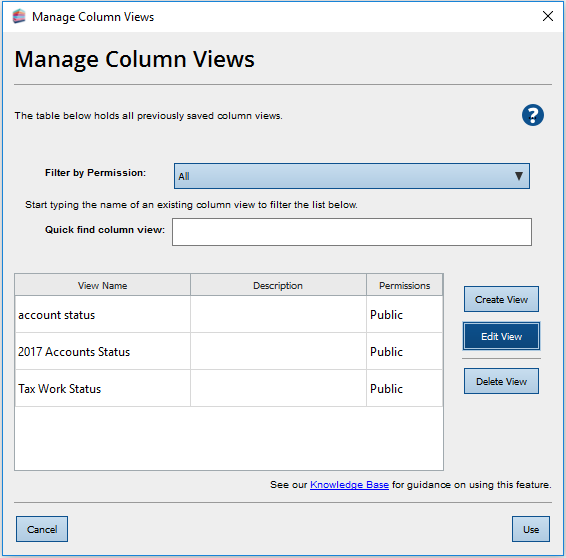 A list of all saved column views will be displayed. Click on the view you want to edit/delete. Add or Remove columns as required or select Yes to delete the view. To move a column, click on the column header and hold the mouse button down. Drag the column to its new position. Release the mouse button to place the column. To resize a column, move the cursor over the column heading dividing lines so that the icon changes from an arrow to a divider. Click and drag to increase or decrease the column width. If the columns are too wide and don't fit the screen, a horizontal scroll bar will be displayed. Select Auto Resize from the menu. TaxCalc will try and resize all of the columns (and the information contained within them) neatly onto your screen. If this isn't possible – due to number of columns or screen resolution – the scroll bar will remain. Remember, you can hide the right-hand information panel for more space (see above). Click on the column header you want to sort by. For example, to arrange clients in alphabetical order, click on the Client Name header. Click on the column header again to reverse the order. Click on + (plus) at the bottom right of the screen to display the Tax Return Filters Panel. This will show the current status of the practice’s tax return workload. Click on – (minus) to hide the panel. Select Self Assessment or Corporation Tax from the Return Type drop-down menu. Select the year from the Self Assessment Year drop-down menu. Click on Refresh to update the table. 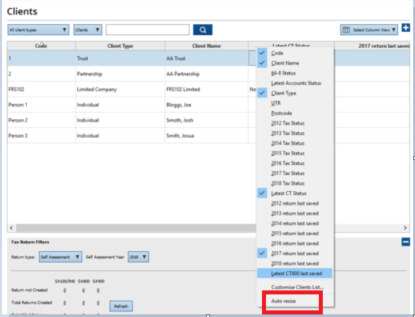 To filter clients that fall into a particular category, click on the number in the table that's underlined. Here you can see, for example, individual clients whose 2018 tax returns have not been created.